These days, more and more people are investing in a tire pressure gauge since it helps them determine if they’re putting the right amount of air in their car tires. A tire that is inflated within the correct pressure range will be more responsive on the road surface, leading to a car with better handling. Correctly inflated tires also roll with less resistance, making for a vehicle with better fuel efficiency. Many modern pressure gauges are of a digital design. They are very easy to use and read while also being excellent value for money. That said, we’ll take a good look at one of the most popular digital gauges on the market today. This digital tire pressure gauge manufactured by AUTMOR weighs 2.08 ounces, and it is about five inches in length. It has also been designed to incorporate two other tools, making it something of a multi-tool design of a pressure gauge. At the rear of the device, a hard and pointed attachment which functions as an emergency glass hammer is mounted, while at the top, there is a small metal point which functions as a tire tread depth reader. 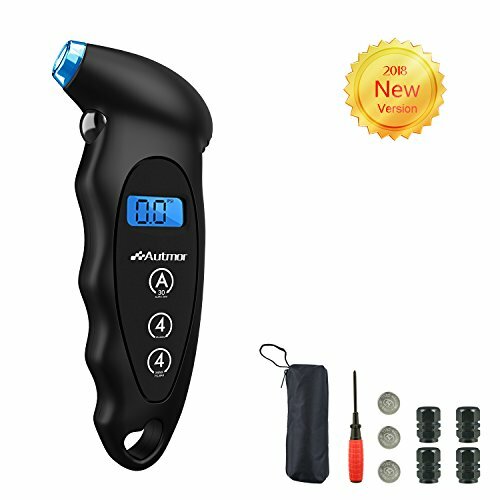 With its multi-tool design, the AUTMOR Tire Pressure Gauge should appeal mostly to people who like to see added functionality to their tools. Since it is nice and small, it can be popped into a glove box, allowing the user to pull it out for comprehensive measurements of tire pressure and tread depth whenever needed. Owing to the built-in glass hammer, it is also a handy emergency tool to keep in the vehicle. Thus, it is also designed for individuals who love to travel. The item comes in one box that contains the tool itself plus instructions for its use. It should be noted that as a digital tool, it does require batteries to operate, so we’re happy to say that the tool comes preloaded with two CR2 batteries. This means it can be used straight out of the box. The pressure gauge at the heart of this tool is both effective and accurate. It is also very easy to read with the help of its gorgeous and bright LCD screen that shows the pressure readings. The tool is also very comfortable and nice to hold because it is small and light while also having an ergonomic design. The rear-mounted glass hammer tool is sturdy and ready for use and comes with a useful plastic cover to avoid any accidental damage. The tire tread measuring device is also a great feature as it effectively puts a tool into you hand that can be used to measure all the most important elements of the tire namely the tread depth and the pressure. That makes for an extremely useful tool indeed. Another impressive feature is the fact that the device can provide up to four different measurements. Some simpler designs will only be able to show pressure as PSI, but this device can show PSI along with BAR, KPA, and Kilograms per Square Centimeter. As we discussed above, the biggest design point of this product is the fact that it is a multi-purpose tool. Therefore, to get the most out of it, you should certainly try to use all the measurement modes it offers. The glass hammer is an emergency tool that hopefully you’ll never have to use. To use the pressure measurement, simply put the device’s nozzle onto the tire valve. The tool will then measure the pressure and display the results on the screen. For tire depth measurements, you should use the small metal measuring device mounted at the top by inserting its small probe down into the tread. If you are going to use the various additional tools, then this could be a good investment. However, if you feel that you will only use the device to measure tire pressure, then it could be an idea to look at a product like the Accutire MS-4021B Pressure Gauge. This has a far simpler design that eschews any extra tools or functionalities in place of a well-designed, simple-to-use, and highly effective pressure-measuring gauge. There are a number of reasons to recommend the AUTMOR Tire Pressure Gauge. The big stand out, of course, is its multi-purpose style of design. But at its heart, it is also an excellent pressure gauge. That, after all, is what you are looking to buy here, and no amount of additional tools will cover the fact that the gauge itself works well. Overall, this is a very accurate pressure gauge that is backed up by a well-designed and solidly built tool housing. What Should Tire Pressure Be in Summer? How to Put Air in Car Tires without a Gauge? Some recommended products may use affiliate links. MyAutomotiveZone.com is a participant in the Amazon Services LLC Associates Program, an affiliate advertising program designed to provide a means for sites to earn advertising fees by advertising and linking to Amazon.com. Amazon and the Amazon logo are trademarks of Amazon.com, Inc or its affiliates. Copyright © 2018 My Automotive Zone | All Rights Reserved.